Christ - what a rest! Judging by my inbox I’ve been sorely missed. Nine thousand begs to sort out. At the current rate, it’ll take my butler, Ivan, several years to write a heartfelt personalised reply to each and every single one of you. You may be wondering where I’ve been the last three months. Like many multi-billionaires, I invested heavily in cryogenic freezing technology when I first became filthy rich. It made sense at the time, the logic being that it would be impossible to spend my vast wealth in one lifetime and so I’d need maybe 10 or even 20 lifetimes to get the most out of it. Now, of course, it’s possible to grow new body parts as you need them in one of your laboratories hidden in the desert and so cryo-preservation has fallen out of fashion with the elite classes. If I have a cold or flu-like symptoms now, I just grow myself a new nose and I’m good to go. I still have all my cryonics gear lying around at home and it always seemed a bit silly to wait until death to be frozen. I always worried I’d be revived and still be dead. Instead, I got into the habit of freezing myself for a few months at a time whenever I needed a break. Of course, that was before my fortune made me miserable and now I mainly use it as a kind of escape. Whenever things get too much for me and the misery, despair, pain and my fat bank balance get me down, I pop myself in the freezer for 2 or 3 months of oblivion. After 3 months, nicely tucked up in my chamber, Ivan hit the rapid defrost button this morning - just in time for the festive season! 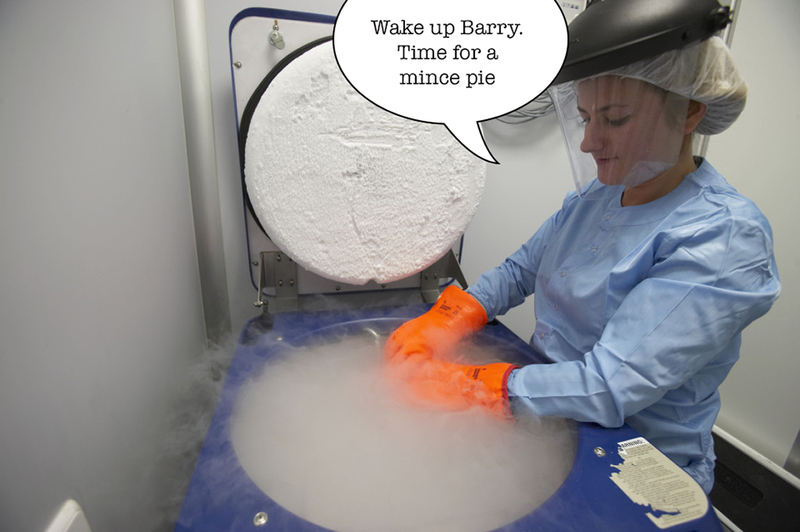 Happy Christmas you poor little poverty-stricken wretches - Barry is back. Glad to have you back mr barry. could you let me know where in the queue my latest beg is?